This post is going to be more of a quick ramble/thoughts type of post. What stops most people from reaching for their dreams and accomplishing them? Recently, I've been dreaming about owning a business and becoming one of the top fitness professionals in the country... not to gloat. I noticed I actual felt scared. Scared of the unknown? Yeah. But was I scared of actually succeeding? It was weird but finally I thought, "Why not? Why not actually become a leader in this industry? What's stopping me?" I came to the conclusion that I was stopping myself! No one else and nothing else! Sure there is the fear of the unknown but success doesn't usually come overnight. There's time to learn. You work and reach a certain level of success and slowly progress higher and higher. Realizing that I'd get use to the success as I went relieved some of the fear. 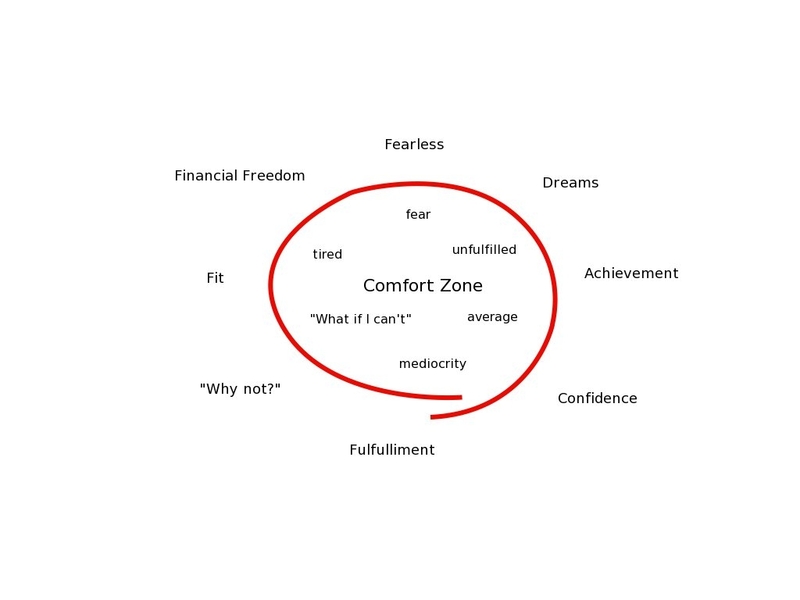 Sure I'd be pushing my comfort zone but isn't that one of the habits of highly effective people that Stephen Covey wrote about? So now I give you the same question. Are you afraid of success? Are you actually afraid of having your dream body? A better financial situation? Or maybe are you afraid of the process... what it will take to get there? If so, why are you afraid? It takes time to change and with that time comes a new, larger comfort zone. You'll learn along the way and over time success and pushing your comfort zone will become habit. Change will become comfortable and you'll be pushing higher and achieving more than ever. While reading about other businesses and how they got started I've observed something. This is a fairly obvious observation but I'll share it anyway. The highly successful dream AND DO! They don't just dream and then get scared and backdown. They take action. They take a little calculated risk. Sure their probably afraid but so what? They take it one step at a time. Will you just dream or will you dream and take action? Will you step out of the boat and onto the water like Peter did with Jesus? Why not do something AMAZING? What's stopping you? Courage is taking action despite fear.